Advantages: Interesting articles on a wide range of subjects, informative reviews of the latest products, excellent plans and colourful artwork. Conclusion: A publication that provides the World War One aircraft modeller with a diverse range of subject matter and up to date news. The sixth issue of Windsock Worldwide is upon us and as always it contains something for everyone. It’s a magazine for World War One aviation enthusiasts...an A4 sized publication that promises an eclectic range of material. 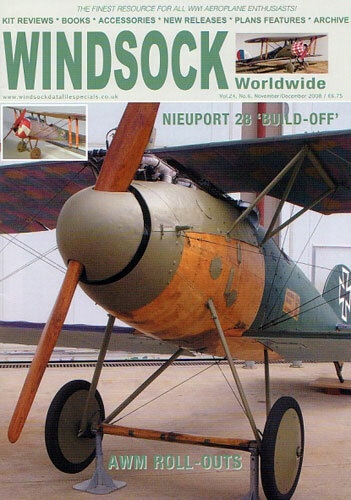 One of the highlights is the Nieuport 28 “build off”. Two master modellers do battle with the 1:48 scale Roden kit and reveal to the reader a remarkable contrast of styles and techniques. The results are enlightening. Colour photos take us through the process and the generous text leaves little to the imagination. Les Rodgers concludes his exposé on RE8 Squadrons with part 8 in the series. It concentrates on 142 squadron and is accompanied by 17 black and white images and 3 pieces of artwork. And if you ever wondered who Harry Tate was, the answer is also disclosed here. “Rara Avis” deals with Rumpler’s G.I bombers and the tale is complimented with 5 period photographs. Ian Stair’s general arrangement drawings are of the Rumpler G.I (5A.15) and are shown in 1:72 scale. George Haddow’s guide to WWI Austro-Hungarian Naval aeroplanes is featured next and this is No.16 in the chain. It covers the Mickl Type F/R, an aircraft that many pilots considered the best flying boat produced in Austria-Hungary. The author’s own plans are included along with an attractive colour profile from Bob Pearson. Not forgotten is the regular collection of kit, book and accessory reviews as well as all the latest news on the restoration front. This time it’s the rollout of the AWM Albatros D.Va and Pfalz D.XII. So there we have it. Another issue that provides information by respected authors along with inspirational articles to keep the modelling juices flowing.